Most DC residents think of Friendship Heights as a shopping mecca. And while Friendship Heights used to be the Rodeo Drive of the DC area it now boasts retailers across a broad spectrum of tastes and budgets as well as the posh designer stores that have long been the mainstay of the area. For years, the luxe Mazza Gallerie, home to Neiman Marcus, Saks, and other upmarket stores, was the anchor for the retail district. 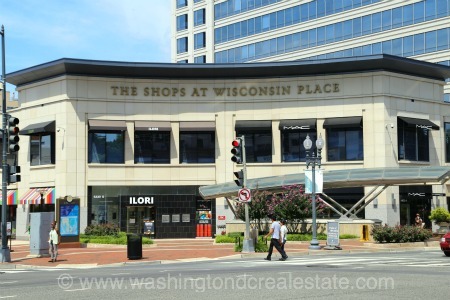 The Chevy Chase Pavilion now calls Friendship Heights home with stores such as J. Crew, World Market as well as the Embassy Suites Hotel. Discount favorites Tj. Maxx and Loehman's are situated further south with the corner of Wisconsin and Western Avenue marking the beginning of the high-end, couture shops including Gucci, Dior and Louis Vuitton. And what upscale shopping district wouldn't be the same without a Whole Foods -- in this case located on Willard Avenue. While the streets are lined with shops interspersed with casual dining options and the increasingly popular lunch truck, Friendship Heights also has neighborhoods of single-family homes tucked away just east of Wisconsin Avenue. In these blocks, it's not atypical to see kids coming home from school in the afternoon as well as minivans parked on the streets. Luxury high-rise condos and apartments are located closer to the Friendship Heights Metro Station. These residences appeal largely to the young couples and empty nesters who want a "quieter downtown" with a DC zip code. Despite the suburban feel, Friendship Heights is still eminently walkable with retail and public transportation right around the corner from most residences. In fact, many Friendship Heights residents identify themselves as "city people" who have brought some of the comforts of suburban living (the quiet, safety, green open spaces) to them without having to move to the suburbs. Bounded by River Road to the southwest and Willard Avenue and Western Avenue to the north, Fessenden Street to the south, and 41st Street and Reno Road to the east, Friendship Heights sits at the border of DC and Maryland.